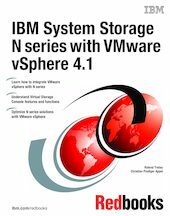 This IBM® Redbooks® publication provides a basic introduction to the IBM System Storage® N series, virtualization, and VMware. It explains how to use the N series with VMware vSphere 4 environments and the benefits of doing so. Examples are given on how to install and set up VMware ESXi server with the N series. This edition includes information about the Virtual Storage Console (VSC), which is another N series software product that works with VMware. VSC provides local backup and recovery capability. You have the option to replicate backups to a remote storage system by using SnapMirror relationships. Backups can be performed on individual virtual machines or on datastores with the option of updating the SnapMirror relationship as part of the backup on a per job basis. Similarly, restores can be performed at a data-store level or individual virtual machine level. IBM System Storage N series in conjunction with VMware vSphere 4 helps complete the virtualization hierarchy by providing both a server and storage virtualization solution. Although this configuration can further assist with other areas of virtualization, networks, and applications, these areas of virtualization are not covered in detail in this book.